If your business relies on its technology, wouldn’t you want to protect the technology you depend on? At Blue Jean Networks, we provide comprehensive IT services to small and medium-sized businesses in the Fort Worth area and we can be of great benefit for situations like the one that XP users are faced with currently. While there is no question that Windows XP has been a reliable and useful operating system for over a decade, its time of usefulness is coming to an end. 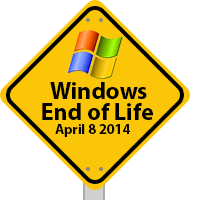 Sadly, with the end of support date so close, there are still over one-quarter of all PCs running Windows XP. In fact, it was the world’s most utilized operating system up until August 2012. Windows XP, reliable as it is, turned 12 in 2014. That’s 12 years of exposure to about any type of virus, worm, or trojan horse created by hackers. By calling Blue Jean Networks and using our consultants to find the most dynamic, and often cost-effective solution, you can help you with the process of upgrading your business’ workstations. Your company can experience far superior online security and advanced software integration with newer OSs than with XP’s antiquated capabilities. For organizations that are seeking to upgrade more than just a couple machines with a newer OS, Blue Jean Networks can present you with the kind of value that only a true IT support team can provide. At Blue Jean Networks, we aren’t a one-trick pony. We can set your organization up with the tools it needs to maximize its potential. Upgrading a perfectly functional computer may be a hindrance and a cost you don’t necessarily want to make, but in order to benefit from a potentially bad situation, consider how Blue Jean Networks can provide answers for all of your company’s IT questions. Our complete array of managed IT services can compliment your business’ operations to expand profitability and promote efficiency. In this way Blue Jean Networks’ IT services provides optimal value; by having a solution for all of your organization’s IT pain points. For more information contact us today at 817-231-0222 to speak with a consultant bout getting your workstations fitted with supported software.